Carl points the laser gun at the wood-fired oven. The "gun," in fact a laser thermometer, reads high: 950. Inside, flames lick up across the oven's vaulted ceiling, eerily appearing and disappearing as pockets of gas ignite and subsume. Carl and Lorena are old friends of my dad, Steve Rogers. Together the three are responsible for "The People's Guide to Mexico," which was published in 1972 and became something of a cult classic. Harper's Magazine called it: "The best guidebook to adventure in the whole world." All these years later, the book is still in print, which is great, but entails regular grueling revisions. Back in the old days my dad used to drive up north to help Carl and Lorena with each new edition. Sometimes I'd accompany him -- from a kid's perspective, these editing marathons were entertaining: a chance to stay up late, listening to the adults bicker and tell crazy stories. Now for the first time since my dad died, I'm stepping into his shoes. I'm staying at Carl and Lorena's cabin for a week to get the 14th edition underway. Of course, we'll be taking breaks to cook. The cabin perches at the edge of a picturesque swamp, and the setting fits Carl and Lorena to a T: There is something of the muskrat in Carl's grizzled countenance; Lorena is more Great Blue Heron. Although Carl swears that my house in Oregon is actually more remote than his homestead, I'm not so sure. The homestead is far north, near the Canadian border, and the land here has a creeping gloom that makes me think of H.P. Lovecraft. People call this region the American Alps, a nickname that doesn't seem too far off the mark: Even in late May, the dark hills are crested with snow. The homestead is one of the region's oldest territorial-era log cabins; it was built in 1880, before Washington was a state. Standing by the wood cook stove beneath the kitchen's low eaves, it's easy to imagine the rough confines of pioneer life. When a family of Danish immigrants, the Larsens, first built the cabin, it was tiny: just two rooms on the ground floor with an upstairs cramped by the peaked roof. "This was the end of the world out here," Carl observes. "It's amazing that they were even here, because this area had no logging at the time. I'd say they were kind of survivalists." The Larsens would have used a wood-fired oven to bake their bread, and it was likely sourdough. Sourdough utilizes the oldest form of leavening: natural fermentation and wild yeasts. As flour ferments in water at room temperature, wild yeasts from the air and from the grain drift down into the mix, which also fosters lactobacillus bacteria. The yeast and bacteria develop a symbiotic relationship that creates a perfect natural way to leaven bread. Every time you take a few spoonfuls for your bread dough, you feed the culture more flour. 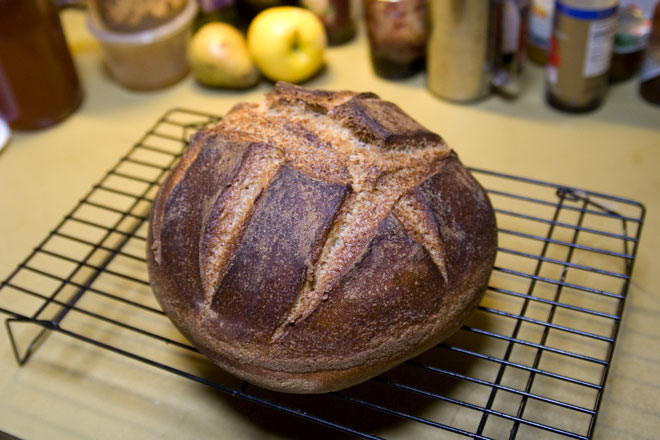 The method dates back to Ancient Egypt, but sourdough is often associated with Western culinary history, particularly here in the far Northwest. In the days when the pioneers carved farms from the recalcitrant hills, baking supplies were scarce. Sourdough starter was a way to conserve precious yeast. Once a yeast culture was established, pioneer families would keep it alive for years. You can make your own sourdough starter in a few days, but old sourdough cultures are prized for their mellow and distinct flavors. "It's like making wine. There's a lot of parallels between cultivating grapes and cultivating cultures," Carl says, warming to the subject. "If you make your own sourdough starter, it's kind of pot luck. But if you get a culture that has a pedigree, then you know it's going to have a good flavor. It's like Carl's sourdough, they've really got it down, man, the flavor." I am a dilettante in the dedicated society of sourdough enthusiasts, but sourdough interests me because it perfectly represents the crux of the matter: cooking exists as an art form because ideas are fostered and shared from one generation to the next. An old sourdough culture can represent a hundred-odd years of care: Someone kept the culture alive all those years, and passed it on to friends, relatives or sometimes complete strangers. In other words, sourdough is a living representation of food as both carefully fostered tradition and communion. All that and it tastes good. Carl has been nurturing his version of Carl's sourdough culture for 10 years, which means his starter may have picked up strains of wild yeast particular to his region. He calls his culture Sasquatch Blend after his nickname for the homestead -- the Sasquatch Observatory. The name makes sense: If you peer into the surrounding woods you can't help imagining strange beasts lurking in the sonorous shadows. I spend most of my visit to Carl's homestead in front of the computer, sifting through endless notes and messages from correspondents. The baking project is a welcome change of pace. The evening before we bake, Carl removes his starter from the fridge and drops two spoonfuls into a mixing bowl. He rifles through a drawer, removing glass jars of grain: barley, rice, spelt, kamut and buckwheat. He dumps the grain into R2 and hits play. After a few minutes of grinding, the finished product is fine and silky. Carl dumps the flour in the bowl with starter, adds water, stirs, and leaves it to sit overnight. (If you don't happen to have your own electric flour mill, Carl says you can find most of these flours already ground at the store, or replace with whole wheat flour. Although the grains Carl uses aren't particularly cheap, the rest of the recipe is inexpensive: It doesn't call for milk or shortening.) The next day at noon, Carl lights the fire in his wood-fired oven, which resembles an adobe igloo. The day is not perfect for outdoor cooking -- a stiff breeze roils the firs, and the clouds are gunmetal blue above the saw-toothed hills. But it's not raining, which counts for a lot in these parts. Inside, the dough is rising. For dinner we make pizza. The oven is going full blast and the pies cook in 90 seconds; the crust is crisp yet chewy, and the air around the cabin smells fantastically comforting. When the coals start to die down, Carl uses a modified canoe paddle to deposit our loaves in the oven. Thirty minutes later, we check the loaves. Carl instructs to test the bread's internal temperature with a food thermometer: The loaf will be 190 degrees inside when it's done. "When baking in a conventional oven, some people start at 425 and then turn it down," he says. "But the temperatures are tremendously inaccurate. That's why I use a laser thermometer!" he finishes, with a vaguely maniacal expression. Twenty minutes later, we remove the bread from the oven. The loaves are round and perfect, like peasant bread in an old still life, and the slices are dense and rich. Chewing Carl's bread, it's easy for me to imagine how a person could actually survive on a diet of bread and water. It's a food unto itself, and the sourdough gives it a nice tang. I think of the two Carls, and the way starter is passed through generations, and my own reason for being at the homestead: Working on my dad's book is another example of the passing on of culture. Our lives would surely be hollower without these exchanges of knowledge and tradition.